Built on the ruins of an ancient Roman villa between the 12th and 13th centuries, ownership of the Castello della Castelluccia has passed and repassed through the hands of a long list of aristocratic families, including the Orsini, Muti, Cenci, del Bufalo, Cancellieri, Azzolino, and Celsi families. One owner, a certain Count Mantemarte tried unsuccessfully to sell the castle to pay off gambling debts. 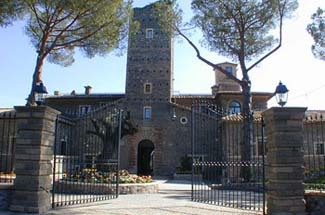 The authorities then seized the castle and ceded it to Prince Livio Odescalchi in settlement. Finally, legendary tenor Francesco Marconi (1853-1916) called the castle home in the 19th century. The Castello della Castelluccia makes an excellent choice if you have a car (free parking!!) but don’t possess the masochistic urge to drive in Rome. No stress and clean air reigns. Rates include breakfast, tax (except 3-euro Rome tourist tax), and service. The castle is about 18 km north of Rome. The nearest metro stop is FM3 linea San Pietro Viterbo, 8th stop “Piazzale della Giustiniana” Once at hotel, there are shuttle buses. Yes. A chapel next to the castle dates to 1412 (seats 50 people). Want to visit Rome but don’t want to put up with the heat, pollution, and noise? Just outside of Rome to the north in a wooded park is a wonderful castle hotel. With a shuttle service that drops you off at a nearby train station that will whisk you into Rome at leisure, you can enjoy the best of the city and countryside. Everything in this intimate hotel is first rate. Note the 16th-century artwork on the walls; some guest rooms feature their own frescos. Each guest room is unique and bears the name of either one of the aristocratic families who once owned the castle or of one of their guests. One room is named after Pope Pius VII, who was a guest in 1814. Rooms are furnished with antiques (or very good reproductions). A few have 18th-century four poster beds. A special splurge is the three-level suite in the 12th-century tower. Filled with 16th-century furniture, a marble bathroom, and fireplace, a terrace looks out over the Roman countryside.